Rebecca Partington sends along the attached list of local businesses and invdividuals who have donated to the Eastlake P-Patch expansion project. 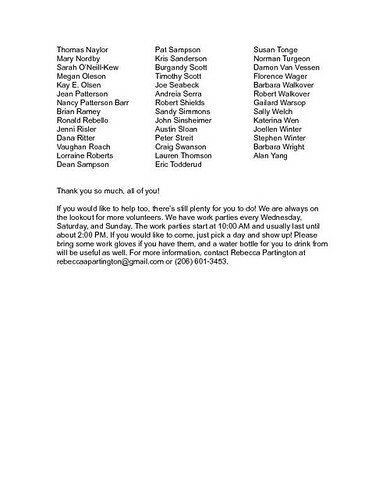 Click the attached list to see who all has helped out. Work continues on the P-Patch expansion. Work parties are generally scheduled on Wednesdays, Saturdays and Sundays. Contact Rebecca at rebeccaapartington@gmail.com or 206-601-3453 for more information. For a selection of our previous coverage of this major expansion project, click here.